How many people plan to subcribe to SiriusXM after their trial subscription expires? View Poll Results: How many people plan to subcribe to SiriusXM after their trial subscription expires? Thread: How many people plan to subcribe to SiriusXM after their trial subscription expires? As you know the Kia Stinger comes with a trial subscription to SiriusXM for a few months. After that they'll try to entice you to join for as little as $5 a month. Wondering how many people here plan to renew after their trial subscription expires? I normally extend it for another year. 5 years ago I would have renewed, but I stream from the phones more these days. Not real benefit of having it, unless they offer a super deal. Other than that I will be streaming all my music. I let Sirius expire on all my vehicles. I'm streaming from the phone or USB media. Last edited by Bubbabiker; 01-11-2018 at 07:51 AM. The audio quality is terrible. It's also overboosted so anything with bass pops the speakers hard. And it goes out when passing through underpasses, tunnels, or I'm parking in my garage. No thanks. Third car with it. Third time it's going to go away. Renewed till Howard stern is done then goodbye..
What's your Kia Stinger suspension plan? 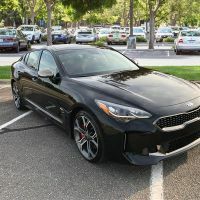 Do you plan to Finance or Lease the Kia Stinger?